Figure 4. Plants associated with the Top End wetlands. A narrow belt of vegetation lines the Top End rivers, streams and billabongs creating what is termed a riparian or riverine habitat. The trees that favour this habitat may also be found in monsoon vine forests located on permanently moist pockets of soil. Several different paperbarks (Melaleuca spp.) live on the riverbanks including broad-leafed paperbark, silver-leafed paperbark and white paperbark. The river pandanus, Pandanus aquaticus, grows mostly on riverbanks whilst Pandanus spiralis is more widespread, being associated with swamps, floodplains and poorly drained areas of woodland. The northern dwarf tree frog hides in the leaves of the pandanus that also shelter the green tree snake. Other riverbank trees are the so-called red-flowering freshwater mangrove, weeping ti-tree, cluster figs, Leichhardt tree and native bamboo. The azure kingfisher perches on branches overhanging the water where it can launch an attack on fish, frogs, insects and crustaceans. The water lily, Nymphaea violacea, with its blue, white, violet or pink petals and yellow stamens is one of the most common of the water lilies in the Top End. The large round two-lobed leaves float on the water and provide shelter and food for large numbers of insects and their larvae. The underside of the leaves and the stems are coated with a furry growth consisting of a tangled mixture of many different types of algae which are important as primary producers for small invertebrates. 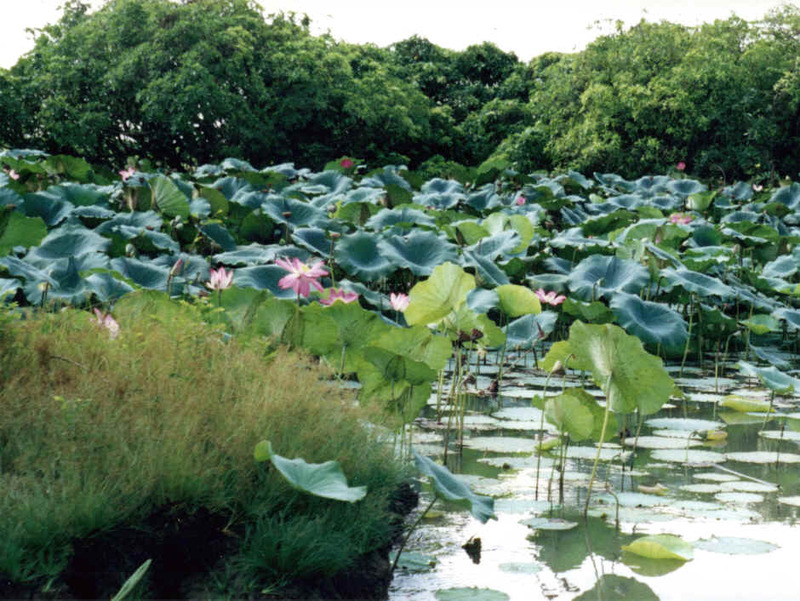 The water snowflake, Nymphoides indica, and the lotus lily, Nelumbo nucifera, are two other common plants of the lagoons. The leaves of the lotus lily may be either emergent (held above the water) or floating. The emergent leaves follow the path of the sun during the day. Many of the truly aquatic plants have both submerged and floating leaves. Floating pondweed is an example of such a plant. The stems of most water plants are not there to support the rest of the plant as for land plants, but simply to act as an anchor chain to the bottom. Submerged plants may have long strap-like leaves (e.g. ribbonweed), leaves with undulating margins (e.g. curly pondweed) or finely divided (Diocaulon sp. and yellow bladderwort). The bladderwort, Utricularia gibba, is named after the little hollow globes or bladders growing on the leaves which trap aquatic invertebrates (microcrustaceans such as Daphnia) and so gain nutrients for the plant. There are several types of small free floating plants. The most common is the fern-like Azolla spp. which can cover areas of still water like a green lawn, much to the dismay of anyone who steps onto the 'lawn'. The grasslands are dominated either by annual species (e.g. wild rice, Oryza rufipogon) or perennials (e.g. Hymenachne acutigluma). Both are very important to the ecology of the black soil floodplains. The rice is a major food source for magpie geese just as the young are hatching, and the Hymenachne forms dense floating mats of grass upon which estuarine crocodiles can build their nests. Its seeds are also being used to rehabilitate tracts of bare land after Mimosa pigra has been removed by aerial spraying. Other grasses of the wetlands are various Echinochloa species (one of which, Echinochloa preastans, which joins with Hymenachne to make floating mats) and two species of Paspalum. The grasslands are located on the featureless black soil plains adjacent to the middle and lower reaches of the main rivers. Here the floodwaters are shallowest, and except for the occasional clumps of pandanus there is no other vegetation to be seen. The seeds of wetlands grasses provide some species of birds with food. Large flocks of little corellas may be seen feeding in the dry season in places where there seems to be nothing but an expanse of dead, dried out grass. The emerald dove has even been seen foraging for seeds on burnt ground. The spikerushes, Eleocharis spp., are most common of the sedges in the Top End wetlands. They grow in all other states of Australia and provide homes for a number of bird, snake and mammal species. Spikerushes grow from robust rhizomes that are a food source for a number of animals including magpie geese and it grows in waters up to 2 m deep. Rice sedge is another common sedge and like the spikerushes it occupies large areas of the river floodplains between the grass plains and the paperbark swamps. Sedges also line the channels connecting the deeper water bodies and fringe the edges of permanent lagoons. Comb-crested jacanas and brolga nest in sedgelands. A number of small plants grow in the various habitats of the wetlands and like most other inhabitants of the region they are delicately tuned into the changes brought about by the arrival and departure of the monsoon. The onion lily appears and flowers as flood plains begin to fill at the beginning of the wet season. It is common along the banks of water bodies, and also grows in the lowland forests. The yellow flowered Ludwigia adscenndens (which has no common name) appears at the end of the wet season. It grows in the damp soil on the edge of the receding water, forming dense mats of vegetation. About August it is usually attacked by large numbers of small black beetles and is soon completely devoured. Other species of plants also use the margins of flood plains as a habitat. One herb, Dentella dioceca, has minute leaves and small white flowers. It grows not only on the edges of swamps and lagoons, but on drying creek banks and channels. Small organisms are at the base of the ecological pyramid, and much of the wetlands life depends directly or indirectly on their presence. Plankton is the term used to include all microscopic plants and animals that drift near the surface of marine and freshwater environments. Phytoplankton is the component that includes the green energy producers that are at the beginning of food chains. In freshwater it is made up mostly of single or multicelled green algae, once considered to be part of the plant kingdom, but now commonly included in a separate kingdom called Protista. Diatoms, which are algae enclosed in silica cases, are important single celled producers in both marine and freshwater habitats. The traditional term zooplankton refers to microorganisms that eat the algae (e.g. rotifers) and the carnivorous microorganisms that prey on the herbivores (e.g. microcrustaceans such as copepods and water fleas, Daphnia spp). It is all rather like a miniature jungle contained in a drop of water, but this invisible world is of immense importance to the whole wetlands system. Figure 5. Microscopic plants and animals of the wetlands.